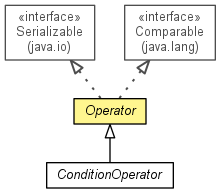 An XDI operator, represented as a relation. Factory method that casts an Operator to the right subclass, e.g. to a TruePolicyStatement. Checks if the XDI policy statement evaluates to true or false. Factory method that creates an XDI operator bound to a given relation. Returns the underlying relation to which this XDI policy statement is bound. Checks if a relation is a valid XDI policy statement. relation - The relation to check. True if the relation is a valid XDI policy statement. relation - The relation that is an XDI operator. operator - The Operator to be cast. A relation that represents the XDI policy statement. policyEvaluationContext - An object that can locate context nodes.